Is it all orange or a particular orange? Like does red-orange offend your eyes as equally as yellow-orange? Asking for science. Don't worry @Goldenbtrfly, I wasn't taking it too seriously, more that I really like seeing how everyone looks at floor plans and build pics. As I mentioned before, lots of times I can't stop myself from looking at a floor plan and redesigning it, so I can only imagine how difficult it is to look at a floor plan and put your own personal preferences aside BUT also try and reward contestants who you genuinely feel did the job better/more thoughtfully AND also see merits of an entry that is not your personal taste. So kudos to the judges; it's never easy. My mom used to dress me in orange (especially rusty shades) when I was a kid. I was a fat little brainiac with curly high pigtails and buck teeth. Yuck! For my R3 Rowhouse Apartments entry in the Monopoly Town Contest. So... I guess I was making a 'statement'? Ya'll are too funny! I don't think anyone used any orange at all - well, one vase, maybe, and that came with apologies. That is a tangerine dream. #255 12th Jul 2018 at 2:15 AM Last edited by gummilutt : 19th Jul 2018 at 2:47 AM. Round 1 scores are out! Hoping there are no mistakes, but really tired so it's possible I mucked up somewhere. If so will fix as soon as it's brought to my attention. Main post scoreboard also updated. Judge1: Great use of upstairs balconies. Interior decorating is lovely. Outside, I do not much like the windows. It needs a little more landscaping, especially at the back, maybe some bushes or pathways. Judge 2: I am a person who LOVES windows, but I feel there are just too many for this build. The landscaping is pretty realistic, but a bit TOO sparse. I'd love to see just a tad more greenery! One tile hallway spaces are not very cool, especially around stairs. Would have loved to see a few more items on some of the patios to round them out. The robot bench seems a bit of of place in the bedroom. I would have loved some community space for gatherings/meeting neighbors. I love that the living spaces have lots of room. I love that there is a bathroom on each level! I love the assortment of greenery in front of the window on Unit 5. The garages and parking space is wonderful to have for Sims who roll those car wishes. Host bonus: Your front view and back view pictures could be better. I know camera mods can be tricky at first, but if you had taken your pictures at angle you could most likely have fit it all in one frame, or at the very least two. Judge 1: Lovely lot. Seen many similar type houses here. Town cornerhouse like this would really need some curtains. I also feel you could of gussy up the roof somehow, adjust heights of some of the parts, maybe. I do not see a trashcan or compactor in either kitchen? I do not see a phone at the blue-ish unit. Judge 2: The lack of lighting - both on the outside of the back apartment and the backyards is a concern for me. While the backyards are lovely, I do wish there was a bit more to do, or lounge chairs in the sunflower one. Bedrooms (some) are a bit too large for my liking. The downstairs seems so harmonious color wise, but little of it seems to carry upstairs (example: the dark wood flooring used downstairs is replaced by carpet in the upstairs hall in the one unit). I would have loved to see some community space for gatherings/meeting neighbors. Placing cars before move-in is also kind of a bummer. Your backyards are both quite pretty, especially the sunflower one! I love that you have a bathroom on each level - multiple on the second story, with shower AND bath options! Using two different staircases is nice for variety. The living spaces are nice sized. Love the shower stalls! Judge 1: Great looking lot! Pool table needs 2 free tiles around it to work well. 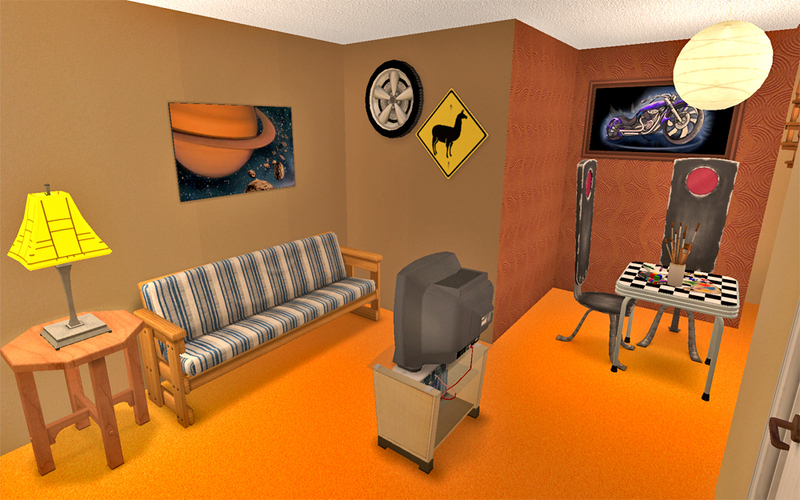 The blue themed livingroom might cause stomping, if all the sims want to watch tv together as there's only one route to the seating area. 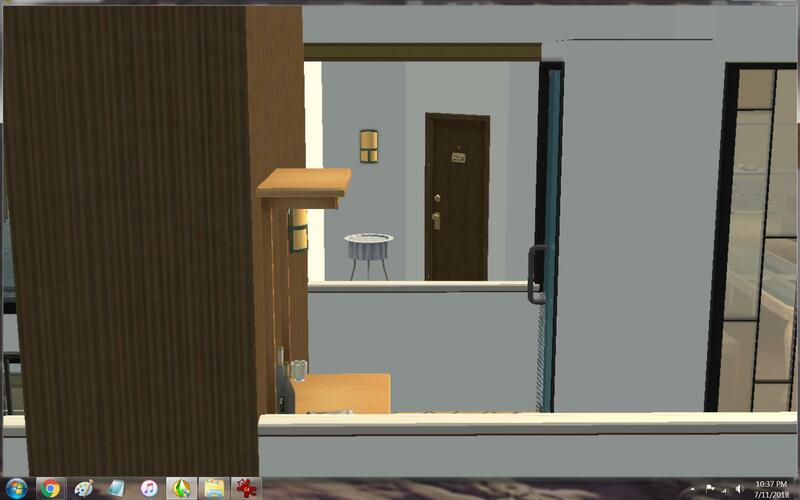 The mailbox, you moved the trashcan to next tile on the left, where is the little box to pay the rent for so the trashcan will block the sims way when playing rent. Judge 2: Hiding the alarms is a neat decorating trick, but it makes me nervous - did she get ALL the rooms with a fireplace, especially since many of them have items right by them? I'd honestly rather see them than move everything in a room or wait until a fire happens to find out - just my humble two cents. I can't see the phones - where are they?! Unit 3 I can see them all, but I am struggling to see any on the other two. I love your complex, I do, but four levels is a LOT of toggling and means long trips for proper meals if on the top floors. Beautiful curb appeal! I love the backyard of each unit and how they are similar, but not the same. Your color harmony per unit/room is spot on. The milk room is genius, such a good idea! Bathrooms on almost every level is a major plus. Having an entryway before the main apartment door is so cute and a classy idea. Little things like the oven mitts on the actual oven door are very cute, and all the deco really makes it feel like a home. I love the shower stalls! Judge 1: I love the outside wall-covering. Great roofing. More landscaping would have been nice, outside feels so empty. Also inside looks a little sparse, lots of empty space. Does every unit have a phone? I see phone in only one unit. I like the playground. Judge 2: I would have loved some kind of walls downstairs, even just a half wall for some kind of room definition. Would have loved to see the playground in entirety - is lighting provided for evening play? I'm confused by the empty room on the ground floor in unit 3? Great curb appeal! Love the simple, yet pretty landscaping and the gardening plots! Thank you for the community space - a simple playground works! Bathroom on each floor is always nice. I really love the sizes of your bedroom and patios. Great play size and the units really strike a balance of enough items/deco to feel lived in, but enough space left for the player to add their own touches. Judge 1: I get a coastal vibe from this building, maybe because of the lovely outside wall colors. Lovely outside decorating and landscaping. Inside could use more decorations, lots of empty walls. Rugs and curtains would make a difference. I would have liked to see some fencing at the front terrace, instead straight drop to the flowerbeds. Judge 2: I'm a bit bummed that the patios are so bare. The chess table with one chair in Unit 2 makes me sad - maybe it could have gone behind the couch instead? I question the choice of the same staircase being used in every apartment since it clashes a bit in a couple. A few bedrooms seem a bit empty to be as large as they are. Such a cute porch area, I really like the look and feel of it! Thank you for some community space - the pond, BBQ area and swing at least allow neighbors to have something to do. I love the "stepping stones" you created. Great play size and the units really strike a balance of enough items/deco to feel lived in, but enough space left for the player to add their own touches. I like your hobby/bonus rooms and the play corner for the child is such a cute touch. Judge 1: Colors are perfect to Pleasanview. Love that. Decoration is beautiful. But the firepit on the patio, I know it will not cause fires but still a weird choice placing so close to the wall. Pool table needs 2 free tiles around it to work correctly. Backyard has only narrow pathways between objects, in short playtesting I am sure it will work fine, but in gameplay, with neighbours there will easily be stomping. Judge 2: I really wish there was a small bathroom in the Community Center, so residents didn't have to make the trek back to their apartments. The second floor bathrooms are a bit large for my taste. Placing cars before move-in is also kind of a bummer. I really LOVE the Community Center and all the activties you included on the lot for the residents! You put so much thought into having things to do that are both outside (good weather) and inside (bad weather/winter). The basement outdoor spaces are very cute and I can see how you tailored them to each family. Your apartments are a good size, I like the openness while maintaining room shape. Host bonus: Missing ground floor entire lot floorplan picture. Please be mindful of cutting of the front or corners in your required screenshots. Judge 1: Love the lot! Only thing what I do not like is the red brick wall covering you used. It is the dirty brick one, and all the other units have nice clean brick. Expecially at bathroom it bothers me. Judge 2: I would have loved to see some community space for neighbors to meet/mingle. I also don't think those flowers out front on the stage can watered without a mod. Fantastic job! You have great curb appeal with the variance of color and material. I love the little balconies off each apartment, they are cozy and have just the right ambiance to them. You used the space extremely well to create spaces that are large, but lived in looking. Your color themes are spot on and I can really get a sense of who would live in each space. Thank you so much for bathrooms and phones on EVERY level. Host bonus: The ground floor full lot floorplan picture is missing. Please be mindful of not cutting of parts of the structure in your required pictures, for example the back view picture doesn’t show the base of the structure so bottom part is cut off. Judge 1: Very medieval looking beautiful house. Screams Veronaville to me. Lovely playground. That big empty lawn area could have had a little landscaping. I would recomment next time if you use this big of a lot, take floorplan pictures in parts. It is so zoomed out I simply cannot see well enough to be sure what is where. I had hard time to figure out where the front doors to units were as you used default replacement doors. First I thought those doors at inner yard were the main doors to those units, but that could not be the case as no gate in the fence to get to it. Patio area is nice, though a little crowded. Much tables but no bbq. Is there room enough to dance (stereo)? Judge 2: The layout was a bit confusing to follow for me. I can't say I'm a fan of just one phone on the lower level on the end units - that is a long walk from upstairs to use the phone! I'm not a fan of Veronaville style homes, but your apartment is cute enough to win me over this time. I like the little foyer that leads to the interior apartment doors - cute touch. Thank you for the garages for Sims who roll those wants and also for bathrooms on each level of the apartment. I am thrilled to see community space included on the lot, and with a variety of things to do that are both inside and outside (and you included a bathroom - yes!). I love the cozy balconies and the garden spaces for each unit were well planned. Judge 1: Love the lot, amazing how much you can put to tiny lot like this. I personally play a lot of mini-lots, and know that in gameplay with big families there will be stomping. I know all the items work fine when you tested, but in game-play it is different situation. Mostly at rooms like with 3 computers, childrens rooms, violin and the bookcase, parties, also stairs because of so many floors, there will easily be stomping. Rooftop bar has no space to put the drink tray. Also rooftop bbq, sim has to travel all the way from ground level kitchen to grill the food they prepared, and serve and travel back to place rest of the food to a counter. Judge 2: One phone in the whole apartment makes for a long walk from the roof, I think at least two would have been nice. Five levels is a bit daunting (in my opinion) for gameplay. The only other thing that I would have loved to see would have been some community space. Fantastic build! I can definitely see the thought and work put into this and how each unit clearly speaks of its residents. (Love the rooftop spaces.) Your rooms are small and cozy, but not cluttered to where I feel I have to rearrange things to play. Thank you for including a bathroom on every level! Judge 1: Love the fronside of the lot. Looks amazing. Backside on the other hand I cannot help but feel the large totally empty backyards hurts my eyes. Even terrain paint, which is free, would make a difference. Also lack of curtains, everyone can see inside from the street (I know maxis curtains are what they are). Lots of empty space at ground floor too. Judge 2: Awww, I'm a bir disappointed the backyard space is so empty. Some community space could have possibly filled that? A few chairs on the balcony would have been a nice touch if the money was there. I like the sleek, modern look of your apartments. I love that your units maintain cohesiveness in floors/walls while keeping individuality. You struck a good balance of an open floor plan in your living areas while clearly having room definition. I love the size of your bedrooms - small enough to be cozy, big enough to still add things. The sprinklers are a nice touch out front for the flowers, as are the garages for Sims who roll those wants. Host bonus: Rent over the limit, I know you fixed this but forgot to update screenshots but to be fair have to deduct a point. 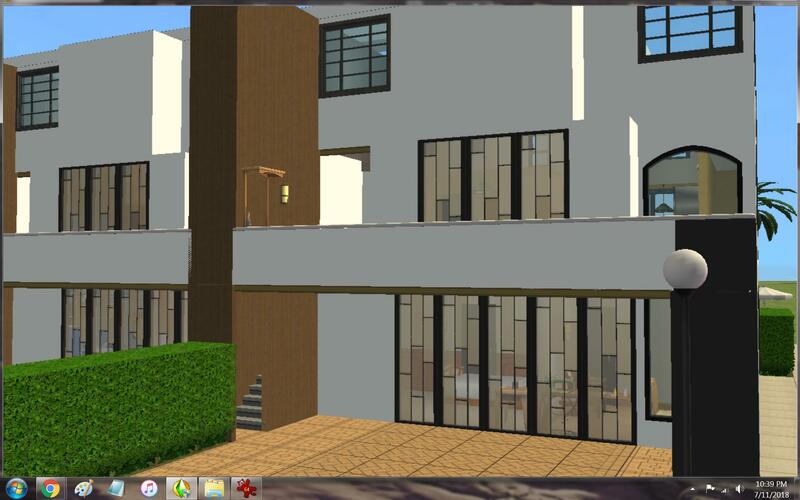 Judge 1: Very modern house, looks a lot like the inspiration. Great job. You have curtains in some windows and some not (I do not mean those 2 story windows)? You mentioned that the pool table is for decorative only, but that does not stop sims using it autonomously (yes single sim's apartment but you mentioned parties), also in my opinion the hedges should be trimmable without player needing to move objects or plants every time. Does every unit has phones? I only see a phone in one unit. Judge 2: Placing cars before move-in is kind of a bummer. I would have loved some kind of community space for neighbors to meet/mingle a bit. Simple, yet attractive landscaping - thank you for the streetlights. You're the only one to use solar panels - very nice to include them for a little rent relief. You really maintained the cohesiveness between units (walls/floors) while keeping each unit unique. A bathroom on every floor is a welcome sight! Your living spaces are nice and open while still clearly keeping the rooms "divided" and the loft space is a nice touch. I really enjoy the backyards being decorated so nicely. Judge 1: Great looking townhouse. Nice backyards, are they made with invisible fencing or does the game count those as public area? I would have hoped for some more terrain paint in backyard, maybe pathways to the pond, garden plots and so. Pool table needs 2 free tiles around it to work well. Judge 2: I'm not seeing any phones in your apartments? It also looks like you used some restricted CC in your build. I know it's a NY thing, but it would have been nice to have just a tad more greenery in the front of the apartments - maybe in that empty fenced area? I'm not quite sure what it is intended for. The apartments seem to have a lot of unused space and seem like they could have been much smaller had some of the large hallways been cut down. I love the curb appeal of your units. I appreciate you taking the time to light the apartments outdoor spaces, especially since you did such a nice job on the backyards - they have just the right amount of things that make sense for each family. Thank you for bathrooms on each floor - from what I see all but one unit has them on each level. PS - Your pictures are a bit squashed. Can you crop them in a photo editing program and maintain the aspect ratio so they don’t distort? The closer you can get for the overhead shots, the easier it is for judges to see everything. PenelopeT: Very interesting lot! I like your take on the concept, with your slightly off-line buildings. The different color facades are a great touch. The choice of fence feels a bit at odds with the lighter airy facades, but I can see why you chose it. Interesting choice to have red brick on the interior when exterior bricks are not. But it certainly does give a very industrial feel. Your interiors are a little more empty than I personally like, but I think you did a good job at keeping in fairly cohesive. Well done! I don't know if that had any influence on the score, but I just wanted to clarify, in case I wasn't clear in the original post. EDIT: Yes, every unit has phones. I'll try to check if they can be spotted in the floor plan. If not, I'll tell you where they are. EDIT 2: Just checked, and yes, they can be seen. For units 2-4, the ground floor plan shows the phone quite well: Unit 4 has the phone on the stone end table near the entrance, Unit 3 has the phone on a wall and Unit 2 has the phone on the end table by the stairs. Unit 1's phone can be seen more easily on the complete overview of the lot. It is on an end table in front of the door. So... I guess I was making a 'statement'? I also have phones in all units and specified this. With so few photos it was impossible to include them and they're not easy to see if on walls from top down view. I'll read over other comments later - currently at work. #261 12th Jul 2018 at 5:01 AM Last edited by Charmful : 12th Jul 2018 at 4:41 PM. Thanks for the time, judges! I've judged in the past so I know it takes buckling down and a free night to get through a bunch of entries. Also, thank you for comments! Judge 1 - I can see how you get the impression the brick is dirty, old maybe, however it doesn't bother me. We have many old packing plants and office buildings using this type of brick in American cities - quite popular to convert into apartments too and they go like hotcakes for a lot of money too. I guess next tome I need a red I will look for the cleaner vanilla version unless I specifically want the old, grungy look. Judge 2 - I'm always torn on whether or not to make a place for residents to mingle because I've done it before and it annoys me. I usually steal the landlord's pizza into my sims' pockets and use it at a party later. For townhouses, there never seems to be a place for that anyway. I continued to play the sims in this lot and it surprised me just how much they came out and chatted up their neighbors just in passing or on the stoops and it gave it a real big city feel. I also watched those flowers for a week of in-game play and no one ever tried watering them, and they didn't wilt. All anyone tried to do with the flowers was smell them and they did it by crouching on the first stair landing. Do apartment flowers get watered or is it only shrubs that get trimmed? I did catch the landlord snipping at the hedges and bushes. Judge 3 - Correct, the stairs are one object - but it seems the stage tool is a hit or miss glitch as some people found they could move objects in all rooms after moving the playable sim in. I wanted to be on the safe side. Note that these cc stairs the sim kind of teleports from one section to the other like an elevator, no walking up and down animations, which I don't mind but some might. @gummilutt - Thanks you for curating the scores and taking on the extra bits to look out for. I think there may be some confusion on 'ground floor' and I apologize. The ground floor picture is not missing - I have three floors, and all full floor plans are there in the post and attached. The lower floor is surrounded by foundation and is technically the one on the ground, the main floor is the one the entry way is at (second story) and the second floor is the third story. Next time I will label clearer but it was not missing. Additionally, the back picture base is not cut off, the foundation is painted the same covering as the bricks encompasses entire first story and I lined up the pic so that the bottom of the building was at the edge of the picture; you can spy a sliver of the grass on the right side; next time I will take those pics with grass as obvious reference to eliminate doubt. Also a note: Magnolia has 78.5 points total in the score post and she is tied with me at 78 in the top score chart, so that needs updated. I have to agree to disagree about the pool table--two tiles around are ideal, but not exactly necessary, especially if there is space in the corners of the pool table, because that's where sims stand when playing. I use the one tile around layout frequently enough and I can't say I've had routing issues for the pool table, even with multiple sims playing. I could see why it might be necessary on my build, as the pool table is in a public building and sims should be able to pass by while others are playing, but looking at Yvelotic2001's entry again, the pool table in Unit 4 has great placement. Sims playing won't have any issues as there's ample space to stand during someone else's turn. Idk. Everyone experiences something different when they play, I guess. But judge 3, I apologize for the apartment doors not being visible! I totally didn't realize that, and no, you're not blind, I don't see the mats either! But they are definitely apartment doors--I checked them at least three times when I was trying to figure out why the apartments wouldn't zone. The only cc I used (besides buyable craftables, which I thought would be okay because it's game items and it shouldn't require an additional download) was the fence. So I've absolutely no idea why they wouldn't show, but at this point, I'm honestly not surprised. Some wonky last minute shenanigans were going on in that lot, I tell you. Why is it that shenanigans only happen when you're building for a contest or an upload? Anyway, if anyone's curious, the door was hidden/recessed behind the patios and I didn't have enough pictures to feature it properly, had I even remembered (I was a little rushed; definitely have to remember to leave time for posting and uploading pictures next round!). To keep the modern look and make some of the architecture have a little purpose, I tucked everything away; it also meant I didn't have to worry about stairs taking up huge amounts of space from the driveway. Anyway, sims go up the 1-tile nook stairs below. Then it leads to the landing below. This nook is not very visible from my pictures and for that I apologize. Because my lot was so wide, I knew I need to use my pictures for closer floor plans. Even I had trouble figuring out what was in them, and I placed everything! And this is what the nook looks like from the front. Because of all the white paint, I can totally see someone missing the cut out where the entrance is. Don't ask me why the mats show up here and not before, though. For that I got nothing. And I have to laugh about all the bathroom comments, as I don't like large bathrooms either, but the space was there, so I used it. I dislike narrow bathrooms more than overly large ones, though, especially because with sims, bathroom parties are the norm. 3x4 and 3x3 are my usual size for bathrooms, too--I guess I've adapted my building to fit my sims' behavior? That second floor bathroom of mine only has 13 tiles instead of my usual 12; here I was thinking that I was doing a good job laying out each bathroom differently, to show what layouts could be done with the space! Ah, well. Thank you judges. I know how hard it is to judge as I have done it many times and in fact have judged the last two rounds of Jo's contest. You're all doing an amazing job! Judge 3: I can't remember where I got the rice paper panels. I'll post them here when I do. It's a whole set of Japanese sliding doors, windows, arches/wall cut outs. The ones I used in this lot are windows and arches for access to the room. Judge 3: Do only 2 apts have doors from the garage to the house? No, Units 1, 3, and 4 all have garage access. You should be able to see the doors to Units 1 and 4 in the overall floorplan view (picture 9), and the one to Unit 3 in the individual floorplan (picture 12). They're all lined up with each other across the complex. I’d like to see a more cohesive interior design within each apartment... For the sake of this contest (or at least to get higher marks from me) please choose one decorating style for each apt. I can accept one apt being furnished by an eclectic mix of hand-me-downs and thrift store jumble, but not all of them decorated in that way. I'll see what I can do, but trust you'll make allowances for the fact that my next build is a tenement. I can’t see phones or smoke alarms in the first 2 apts - and did you include extra smoke alarms for the fireplaces? They all have phones and kitchen smoke alarms, but they are difficult to see and I can't remember if I put smoke alarms in the rooms with the fireplaces and can't find them either, so you clearly should dock me those points, even if I did. I hate how you can't orient the plan camera so as to see both sides of the wall at once. In future builds I'll attempt to have a consistent location for these items, analogous between units, so if I can't get shots that include them I can at least say: "All the phones are on the walls immediately to the left of the entrance and all the smoke alarms are on the wall above the stove even when you can't see it because there's also a shelf there" or some such. Please also try to keep your pictures oriented the same way - I find it confusing to mentally try flipping a picture 90 degrees to compare apt units. Remember, if I can’t see it, I can’t judge it. I'll see what I can do, but that's going to be tough, since my usual method of picture taking is to move around the room taking a bunch of different angles and then selecting the one that shows off the room best by going through several winnowings. This angle is likely to be different from room to room and apartment to apartment, particularly since I'm trying not to be to uniform in things like bed placement. I'll have to experiment with how best to show the best features without disorienting you. Would descriptive labels on the pictures help if I can't get acceptable pictures without rotating? Something like: "Dining room looking toward living room, Unit 1?" No, I couldn't. I tried, believe me! Future builds will have the short side of the lot facing the street so we don't have to go through all that. I need to experiment with camera mods anyway, since this one seems to crash the game periodically. Thank y'all for your service and the detailed comments. #266 12th Jul 2018 at 9:41 AM Last edited by Magnolia : 12th Jul 2018 at 9:51 AM. I did the math and I'm pretty sure we are in fact tied at 78. I shouldn't have 78.5, just 78. So I wasn't sure if I'm expected/allowed to clarify some stuff or not. I am actually quite happy with my score, so honestly no worries there. But, I guess I just have some quick notes on a few things. Love the lot, amazing how much you can put to tiny lot like this. I personally play a lot of mini-lots, and know that in gameplay with big families there will be stomping. I know all the items work fine when you tested, but in game-play it is different situation. Mostly at rooms like with 3 computers, childrens rooms, violin and the bookcase, parties, also stairs because of so many floors, there will easily be stomping. Rooftop bar has no space to put the drink tray. Also rooftop bbq, sim has to travel all the way from ground level kitchen to grill the food they prepared, and serve and travel back to place rest of the food to a counter. Judge 1: the apartments actually have a lot less stomping problems then even I expected to be honest. The furniture is just a hair tighter than I usually do, but I found it played really well. I actually playtested each unit with the intended families(so a 3 sim, a 4 sim and two 5 sim families) for several days and honestly the only stompy area I found was that little 1x3 bathroom. For some reason they got themselves stuck in there a couple times. But then that's possible with most bathrooms. I really should have mentioned the details of all this in my post, but I both directed the whole familiy to specific places all at the same time and then I also let them freewill for a few days. The 3 computers worked fine simultaneously since there is always a reserved space behind pretty much all pulled in dining chairs(a couple styles are bugged but the ones I used are fine), so all the computers can be accessed even if the others next to them are occupied. The only potential problem there is if a sim just happens to be getting up from a chair when another is walking by. So while it's definitely possible that it'll cause problems it's actually in my experience very rare. It's the same sort of thing as placing a dining table and chairs next to a wall. Honestly I have always set things up in that sort of way and I personally haven't had a problem with it. Also, the violin and the bookcase in the basement actually do work simultaneously, I tested those very specifically and rearranged it so the bookcase was accessible while a sim was playing the violin and also while others were sitting on the couch, all at the same time. Also on the roof right next to the grill there is one of those park style tables for setting any prepared food on. Though it is true sims would have to bring the raw food up from downstairs. I guess I hadn't considered adding a mini-fridge up there, but yeah that could have made it better. And the last thing is the stairs I used are CC non modular stairs(found here), and how they work is there are actually no animations at all, sims just kind of teleport from bottom to top and visa versa. Because of that they actually move freely from the basement to the roof very quickly. It is kind of a weird, almost cheaty thing though, so I would understand if that wasn't a fair consideration. But just wanted to note that most CC non modular stairs have that quality to them. It is what it is. But in my experience they don't cause any stomping issues. So just, yeah, lots and lots of playtesting occurred. I always build this way and it has worked well for me. Your mileage may vary though. Anyway, I'm super happy you guys. Thank you so much for the lovely words and feedback! #267 12th Jul 2018 at 10:45 AM Last edited by yavannatw : 12th Jul 2018 at 11:53 AM. Had a read of the comments and just wanted to respond. Judge 1: I understand your comment about lack of decoration. At the time I was worried about the budget going over so was sparing and figured any Sims moving in would add their touches. I think the porches are fine without a fence. I've seen plenty like that. Judge 2: I don't think the bedrooms are too empty, except perhaps unit 1. (I don't like poky.) I used the same staircase in each unit as this is standard in any apartment block structure - it's cheaper when being built. I've yet to see apartment blocks with different staircases in each unit. Judge 3: Same comment as above regarding structure and main build of apartment block. I figure units start off the same and Sims redecorate when they move in. Again I was worried about going over budget so used basic walls. I disagree completely about the bathrooms having too much space. Thanks to judges overall. It's not an easy job. Edit: I loathe Maxis curtains so won't be using any. If I lose points because of it, so be it. I am at work and answer rest later, this one I needed to clarify right away. No it was not the pool table, it was the mailbox. 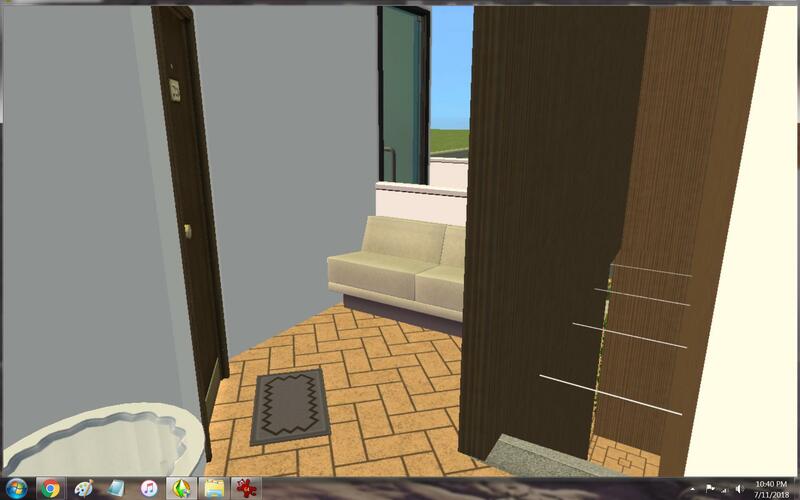 You did put trashcan to next tile, left side of it, and it will prevent sims paying their rent. Trascan will block their way to the small rentbox, located left side of the mailbox. I had to playtest that setting myself to be sure. And if I am misstaken and the trashcan is not in the next tile from left of the mailbox, you will naturally get points back. There were no interior pics from my reference image, so I chose to go with the open plan concept that is all the rage in the US. I did try a half wall, didn't like it, it closed it off too much. I prefer open plans versus little rooms all over the place. I could have put a rug under the table, but yuck! Ever have a toddler eat at your table? LoL Also makes less foot stomping. The lack of bathroom fixtures, welp, totally missed that. All have phones, just can't see them, all have alarms hidden behind the stove vent. There was a trash bin in apt 1, but I moved it when add the piano and forgot to put it back I guess? I took it and it somehow didn't get included when uploading. With a limit in the uploader, I was trying to make sensible batches of pics. Clearly that one was not sensible to me! Thanks for the positive feedback on the playground. It was actually a bit of a last minute decision, I originally had four units, and I'm still a bit ambivalent about it. It does have lighting, I place all my lights at night so I can see how the light glow effects play off the room. @gummilutt @magnolia Hmm maybe I misread the score then. I could have sworn I saw 78.5 as your grand total above, but now that I look it is 78. So never mind my last note. Sorry! #271 12th Jul 2018 at 4:43 PM Last edited by CatherineTCJD : 12th Jul 2018 at 5:36 PM. This is one of those instances where conflict is probably immanent I'm judging, and I don't like overly huge wasted-space bathrooms. Luxury bathrooms are fine. In moderation - like 1 per unit - and probably in the master suite only. As I said in my comments, "I’m not taking off for it per se, but you should know, wasted bathroom space bugs me, and it will keep your build from getting a perfect score from me." FTR, I have no problem with the "structure and main build of apartment block", my comment (that all 4 upstairs hallways use the same walls/floors) is referring to the fact that you were supposed to personalize each apartment within the unit. AND, suggesting that it is hard as a judge to tell which unit is which when they are all using the same floors/walls. The game has many different plain paints/carpets that all fall under the same price. You could've used a wider variety without compromising your budget. ETA: Can anybody help me with this? Can anyone figure out why the lights stopped lighting? (It's posted in the Mentors thread, but haven't had any responses yet.) Thanks! Oh, floorplan shots I can do all the same direction! That's a relief. I rotated Unit 5 because it wasn't getting the full treatment and I figured that rated a closer floorplan shot, which was impossible to get without rotating. I'll bear that in mind in the future. Thank you very much, judges, for taking the time to review and provide feedback. However, judge 3's comments and score are in relation to Charmful's build - @gummilutt could you please update my score table and feedback? I'll take floorplan shots by unit in the next round; I didn't realize how much information the judges got from those. I'll also list where small items are in the description to help you locate them. Judge 1: I'm glad you like the look of the place; I'm planning on using a heavy cc version of this build in my medieval 'hood. The lawn area was left empty for water balloon fights and tag, but I should have added some bushes or flowers against that wall and experimented more with terrain paint. With the doors, I think it will be more obvious which is the apartment door with future rounds, but if not I'll mention that in the description, too. As for the patio, it is usable but only two sims can dance before the bar gets crowded. One of the tables had originally been a BBQ and when I decided I needed more seating I thought I'd moved it to the corner by the gate but instead I seem to have deleted it. Oops! Judge 2: The hike for the phone is noted; I completely forgot to put them upstairs. As for the style, I don't know if my future entries are going to be Veronville-ish, but the structures are going to done so that they can be easily redecorated to fit into my historic 'hood. I'm pleased this one turned out well, and I hope that I manage to make the mix of old and new work for the next rounds. I'm glad you like the yards; they are a big part of how I tried to personalize the apartments for my imagined tenants. I love having community spaces in apartments; they are the main reason I play apartments as I like watching neighbours use them. ... However, judge 3's comments and score are in relation to Charmful's build - @gummilutt could you please update my score table and feedback? I've already pm'd Gummi about that - I'm sure she'll get to it when she can. I should have made part of unit 1's nursery into a bathroom and then shifted the layout of the loft area to make more efficient use of that space and the bathroom. I didn't want to make unit 1 and 4 identical, and I got frustrated with the layout near the stairs so I just gave up and decided to make a luxury bathroom. Like you, I don't like huge bathrooms, but I've seen some monstrosities in the real world so I figured some people must like them. You should see some places - more bathrooms than bedrooms, and master ensuites as bigger than bedrooms. We're living out of country right now, so have been renting a house and it has a stupidly large ensuite - I am actually using half of it (including the bathtub) as storage as the house doesn't have a basement, attic, or other storage room. I'll keep the flooring in mind for the future. While I was making the apartment shells, I had used different carpets to keep the units clear to myself, but then I replaced that with the wood flooring when decorating. It didn't occur to me how useful different floors would be for others to view the apartments. I appreciate the feedback and thank you for taking the time to do the review and provide the comments.